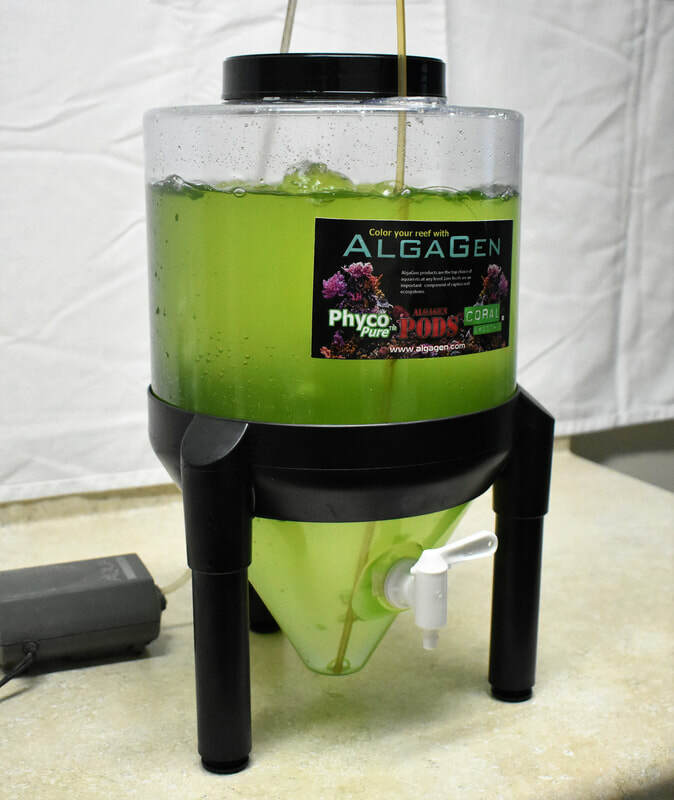 AlgaGen is offering a new Live Feeding System for LIVE baby brine shrimp!! This is a program you can set up on a regular basis, or just order as needed! AlgaGen has found a unique cyst that is small and easy to work with. We will offer 200,000-300,000 baby brine shrimp per portion for $45. With your first order, we will offer half off ($23) with purchase of container, and provide a free starter food supply to keep the brine fed and alive for about 2-4 days. If you wish to purchase additional Brine Shrimp food, it will be available as an in store use product. We will supply a container (conical, clear polycarbonate with spigot at the bottom-nice looking system)-also $45 plus shipping. The unit will ship via ground to save on shipping and generally takes 3-5 days to arrive to most of the US. Once you receive your container, contact us and we will be able to ship out your brine portion at that time. . The unit takes up about 1 sq ft., and you will need to supply a small air pump and tube for oxygen exchange. We recommend filling the container up to 2 gallons and then adding our baby brine. You can fill the container to 3 gal then add the brine, and you will get another 30% added to your gross . We will send you portion bags along with each order of live brine, we recommend an 8oz portion (around 6,000-8,000 shrimp) be sold for around $5 (you can charge more, or less, portion however you see fit). That would mean there are about 38 8oz portions per container, which should gross $145 after the initial system purchase. A pretty good turn around, and freshwater and saltwater people love baby brine for fry rearing! The brine can be fed directly, partially, or stored in the refrigerator and fed out that way. Keep in mind that some losses will happen if stored in a refrigerator. We are maintaining a minimum order, so if you need the baby brine portion, you will also need to order other products to make the minimum. 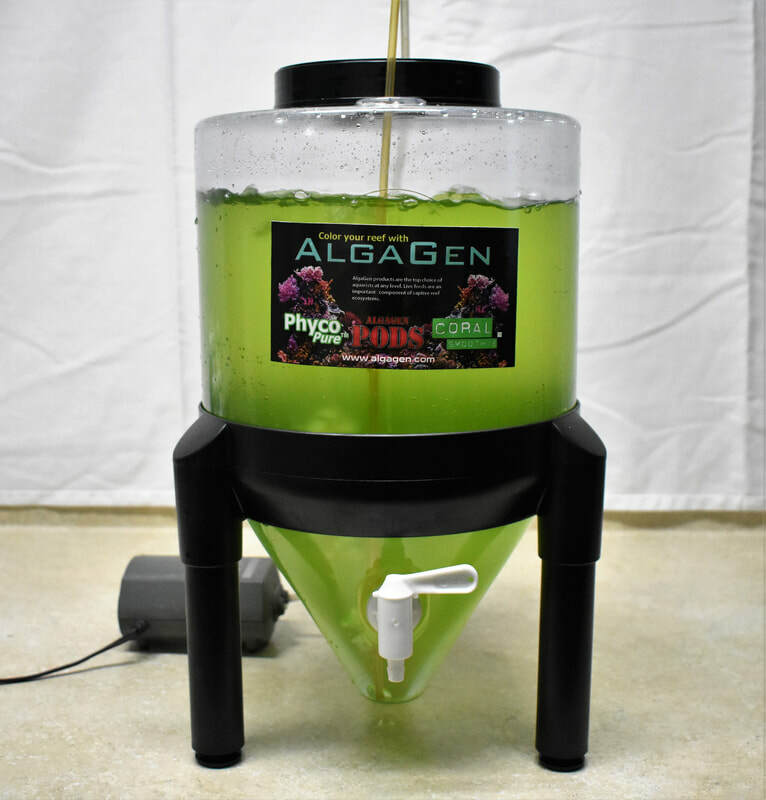 We recommend our PhycoPure Greenwater as an up sell to people who may want to gut load, or raise up the brine for a few days to feed a larger organism. We will need 24 hour prior notice to hatch out fresh baby brine for your order. Orders must be submitted by 2pm Monday-Wednesday in order to hatch out and ship your order.